Heat 1 tbsp. oil in a large skillet over medium high heat. Add steak strips in an even layer and sear on each side, about 3 minutes per side. Remove to plate and set aside. Add remaining 1 tbsp. oil to pan and add vegetables from veggie kit. Sauté until lightly browned and slightly tender, about 5 minutes. Return steak to pan and add sauce; stir to combine. Lower heat to medium and allow to simmer 5 minutes. While fajita mixture simmers, heat a separate pan over medium high heat. Add tortillas, one at a time, to warm and lightly brown on each side, about 30 seconds – 1 minute per side. 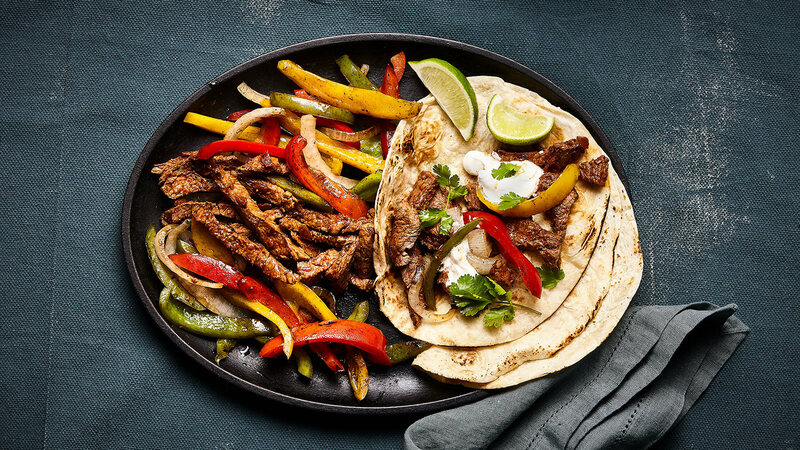 To serve, spoon fajita mixture in warm tortillas. Top with a dollop of sour cream and fresh cilantro.